Today, I want to discuss the other key to a graduate program informed by self-regulated learning principles: goal setting and feedback. I just finished typing up our graduate students’ annual reviews. You might remember that our end of the year report was what started me on my quest to consider what a graduate program informed by self-regulated learning would look like. I learned from my fabulous colleagues Chris Wolters and Shirley Yu that intrinsic motivation, which exists within the self and usually stems from a personal interest in a task, is much better for achievement than external motivation, which usually comes from an external entity setting the goal. Hence, the final key to a graduate program informed by self-regulated learning is goal setting and feedback, informed by intrinsic motivation primarily, with some extrinsic mixed in. As part of our annual review process, we asked students to set goals for themselves (increasing intrinsic motivation), as well as review their own achievement this year by reviewing their goals from last year. Students first outlined their achievement by summarizing their achievement in light of their goals from last year. Some students exceeded their goals, others achieved their goals, and others fell short. Through the process of self-evaluation, I believe the students set better goals for themselves for the coming academic year. Students who did not quite get comprehensive/candidacy exams done stated firm goals to have these exams done this year. Students who were close to defending their master’s theses made plans to finish them over the summer. I am happy to say that several students have already made strides toward achieving the goals they outlined. I certainly think that the process of self-reflection and goal setting pushed their achievement in the months since they completed this task, and I expect to see those students who took this task seriously have greater achievement at the end of this academic year. Advisors read over their students’ annual reviews, and rated their students as making “excellent”, “satisfactory”, and “unsatisfactory” progress – this type of feedback is usually called “grade-oriented feedback”. 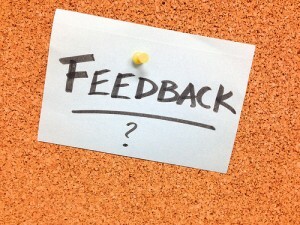 The advisors were also asked to write a narrative that included “areas of strength” and “areas of improvement” – this type of feedback is considered more “process-oriented” feedback and is individualized. All students received grade-oriented feedback, though there was great variation how much individualized feedback students received, and the variation was all between-advisor, rather than within-advisor. I personally like to give my students detailed individualized feedback, though others gave only a few sentences. As I was discussing this with one of my students, he assured me that “Bad is Stronger than Good” and that as long as the individualized feedback wasn’t useless, insignificant, or inappropriate, the students would benefit. Thus, I think that the important thing is that students get great to good individualized feedback. Our students also received a more “standard-based” feedback from the faculty, as we evaluated each student by cohort. Keeping in mind guidelines for “satisfactory” progress for each cohort (these are outlined in our handbook), we gave each student an “excellent”, “satisfactory”, and “unsatisfactory” progress, which sometimes differed from their advisor’s assessment, and gave them individualized feedback that was informed by the standards we expected at that point in their graduate education. This process worked really well, and thus the students got feedback from both their advisor and the graduate faculty. In conclusion, much research has shown clear associations between goal setting, feedback, and achievement (see Locke and Latham, 2002 for a review). This final key in graduate education may be the most important. Thus, if you aren’t getting at least annual feedback from your advisor, ask for it! If your graduate program currently does not conduct annual reviews of graduate students, suggest that they consider doing so. Most graduate programs are designed based on tradition (We have always done it this way! Students don’t need that, I never had that and I did fine. ), rather than what scholarship tells us works for student achievement and learning. Let’s change that. Posted in Graduate Training	Tagged advising, advisors, annual review, feedback, goal setting, graduate school, graduate students, mentors, self-regulated learning	Bookmark the permalink.